Reality gets rubbed in America's face. The United States is at risk of having its pristine credit rating lowered if politicians in Washington cannot agree on a plan to bring down the nation's deficits over the long term, ratings agency Standard & Poor's said Monday. S&P, one of the three main agencies that rate the ability of companies and sovereign nations to repay their debts, lowered its outlook for America's long-term credit rating to "negative" from "stable." An AAA credit rating means that there's basically zero chance of default - it's inconceivable that the debtor will fail to repay the money and interest on schedule. In other words, AAA bonds are a totally safe investment, suitable for widows, orphans, and the paranoid. Being totally safe, AAA bonds pay very little interest; during the early days of the recession, American government bonds actually paid negative interest when inflation was accounted for. The government could sell such lousy investments only because investors were so frightened of global uncertainty, with last week's corporate titan becoming this week's bankrupt, that they cared more about safety than anything else. The only thing better than free money is when someone pays you to take their money, and that's where the United States was. 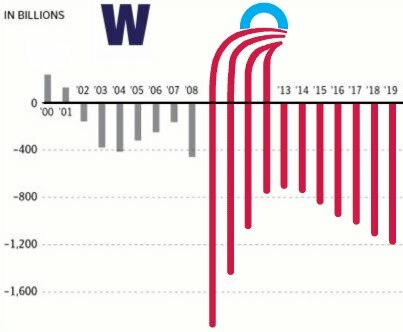 Unfortunately, our feckless Democrat-controlled government took extreme advantage of their majority during 2008-2010; our favorite graph shows what happened to our national deficits resulting in today's now-gargantuan national debt. Big as they were, our deficits and debt under George W. Bush and previous presidents were manageable in comparison to our world's-biggest economy. They're not anymore; our national debt is projected to be bigger than our entire national income sometime in the next presidential administration. When you owe more than you can ever possibly make, you're no longer guaranteed to be able to pay it off. At that point, there is a risk of default; a wise lender will charge you more interest to compensate for that risk. S&P's rating warning is simply reflecting that inconvenient reality. Why, though, did S&P change their outlook now? We've had monster debt before, such as during WWII; we've had bickering, divided government; we've even had recessions and depressions, yet our credit rating never came into question. What S&P is saying here is that from a ratings perspective, it does not really matter whether government spending gets slashed or whether we all get taxed to death. Either way, our debts could be paid off as long as the government stops spending more than it takes in. S&P is saying that they see no chance of that happening anytime soon. How do you suppose they reached this conclusion? Let's look at the record: Last year's Democrat Congress failed to pass a budget at all, for the first time ever since it became the law that they are required to do so. This year's Republican Congress loudly trumpeted the need for deep cuts, which S&P was doubtless glad to hear - but then they passed cuts so insignificant as to be virtually invisible. The only hope on the horizon was Paul Ryan's budget, which every analyst considers serious and adult even though many strongly disagree with the actual details. How did President Obama respond to this total failure to cut anything worth speaking of, but with a serious proposal on the table for next year? He came out with a barnburner of a speech calling the Republicans un-American SOBs who want to starve the poor, kick aged widows into the gutter, and subsidize plutocrats. Does any group of normal human beings want to negotiate with someone who's just publicly called them the Devil Incarnate? No; instead, the Republicans will be more and more determined to achieve their goal to make Obama a one-term president no matter what it takes. Why negotiate with someone who hates you, whom you hate, and who you expect to get rid of next year anyway? Given all that, S&P is almost certainly right: our fiscal ship is not going to get righted before 2014 at the very earliest, if even then. President Obama could have avoided this by seriously negotiating with the Republicans and slashing spending, as President Clinton did before him, but he refused. President Clinton was rewarded with a budget surplus, a successful re-election, and the fond memories of most Americans. President Obama has chosen a different path. S&P's downgrade is merely a roadsign on this other path: one that's large, red, and octagonal. Alas, it doesn't look like our president noticed it when it was in front of him, and he surely won't pay attention to it now that it's in his rearview mirror.